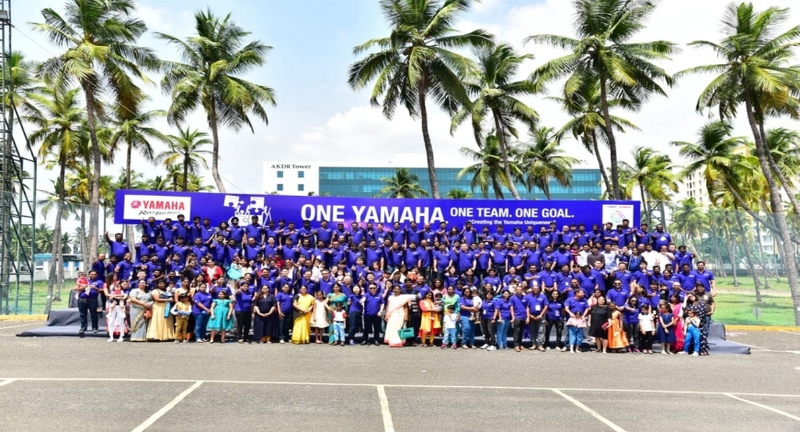 The foundation day was celebrated by Yamaha Motor India at its HO in Chennai, plant locations in Chennai, Surajpur & Faridabad as well as area offices. Yamaha Motor India (YMI) celebrated the 63rd anniversary of its parent company, Yamaha Motor Company Ltd. at all its offices and plant locations across India on July 1st & 2nd. The foundation day also called as the “Yamaha Day” is celebrated across the globe with an aim to encourage Yamaha employees worldwide by fostering a better understanding and affection towards the brand and ultimately manifest “The unique style of Yamaha” through products and services. On this occasion, several activities were conducted to educate the employees on the successful journey of the brand since 1955 and its consistent effort to develop innovative technologies to meet the personal mobility requirements of the customers in future. In Chennai, the celebrations began with the inauguration of YMI’s new Corporate Office at AKDR Tower, Old Mahabalipuram Road, which will also be the Head Office of Yamaha Motor India Sales Pvt. Ltd, (YMIS), the sales & marketing company. A New Vision Document and the Brand Direction of the Yamaha Motor India Group Cos. was also unveiled on this occasion. This year the celebration entails, bringing-in the blue color that is synonymous with Yamaha Motor Racing as a part of internal corporate set-up as well as external retail landscape. The pan-India Yamaha dealerships also joined the celebrations with an objective of highlighting the excellence in personal mobility to the visitors and customers. In the year 1955, Yamaha Motor Company in Japan began the production of its first product, the 125cc motorcycle "YA-1“. The grand success of the “YA-1” model highlighted the reliability of Yamaha’s technology and steadily helped the company to expand its presence across the globe with a range of exclusive and trusted products. Moving forward, the company envisages to establish a strong market presence through its sporty and stylish products which creates a sense of excitement among the customers.